LUNA RSVP set includes the petite A1 Champagne pearlescent envelope and matching RSVP card. RSVP card in Champagne pearlescent cardstock measures 5x3.5 inches. Papers for both the RSVP card and envelope come from Italy. If you print, the rsvp card comes 4 to a sheet, so you print and cut. If we print, we cut to 5x3.5 inches. Templates for both parts comes with the kit. Ethereal and Romantic DIY wedding invitations. 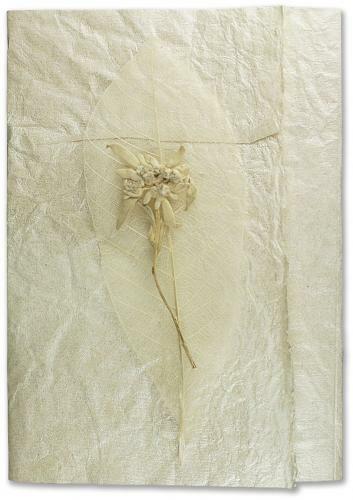 Ivory pearlescent handmade paper wrapper finished with natural skeleton leaf and pressed Edelweiss flower. Really beautiful -- like fairy wings. Elegant invitation wrapped in an ivory-colored, textured, pearlescent handmade rag-paper wrapper. Crinkled texture with one natural deckled edge. Wrapper is scored for easy assembly and professional finish. Invitation card is a heavy champagne pearlescent Italian paper. Matching champagne pearlescent mailing envelope. Overall Size: 5-1/4 x 7 1/4 A7 envelope size. Invitation:Heavy champagne Italian pearlescent cardstock (105 lbs).